Depending on the size of your event (and your budget) you will have a variety of different tents available to choose from. As lightweight cover, party canopies are primarily used as shelter from direct sunlight or light rain. A type of canopy that is collapsible and easier to set up for the do-it-yourself renter. Because they are quick to set up, they may be kept aside as your "Plan B" additional shelter if the weather were to turn sour during the event. These are supported by a series of center poles that immediately stir a feeling of festivity. They can be decorated anywhere from lavish elegance to a "Big Top" circus spectacle. Pole tents are of a time-tested design that can stand up to sever weather. For aesthetics, a classic pole tent with its elegant peaks and valleys is hard to beat. Pole tents are most suited for a grass surface. These are usually constructed of a vinyl covering over a metal frame. No center poles are needed and thus have many benefits over pole tents in regards to the internal layout for your event. These should be considered for concrete, asphalt, and patio surfaces. Like pole tents, these are also able to withstand tough weather. A level location is very important. If your event is on grass, make sure the surface is even, with no dips or holes. Once the lights are low, the risk for guests to stumble becomes more likely. If necessary, sub-flooring may be chosen. On an even asphalt surface, carpeting may be just what you need. Depending on the size of the tent and your location's municipality, building permits may be required to set the tent up. Plenty of time should be allowed for this process, as the wheels of bureaucracy sometimes turn slowly. 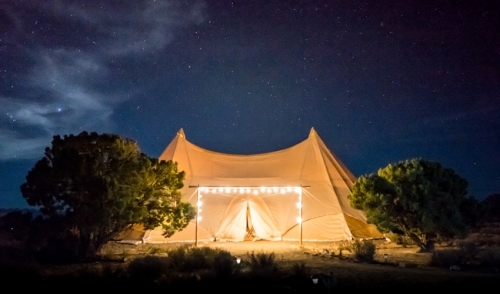 Though tents are temporary structures, you are essentially creating a room. As such, make sure guests are able to easily exit if an emergency should occur. Consider fire extinguishers if heaters or cooking will be part of the event.